BUDAPEST, Hungary – Popular around the world, HARMAN’s JBL VTX and VERTEC® line arrays, and Crown I-Tech HD amplifiers, were particularly in demand this summer at festivals throughout Hungary. For celebrations large and small, held indoors and outside and with audiences up to 30,000 people, JBL was the top choice for MEDIA EVENT Ltd., one of Hungary’s largest event producers. The system was recommended and supplied by Zsolt Szarvas of MS-Rent (Microsound Ltd. Division), a major European dry hire PA rental company (www.microsound.hu). MS-Rent has been a long term partner of JBL for over nine years and invested heavily in the new VTX V25 system around a year ago in order to meet the increasing demand and requests from the wide variety of international touring artists visiting Hungary. 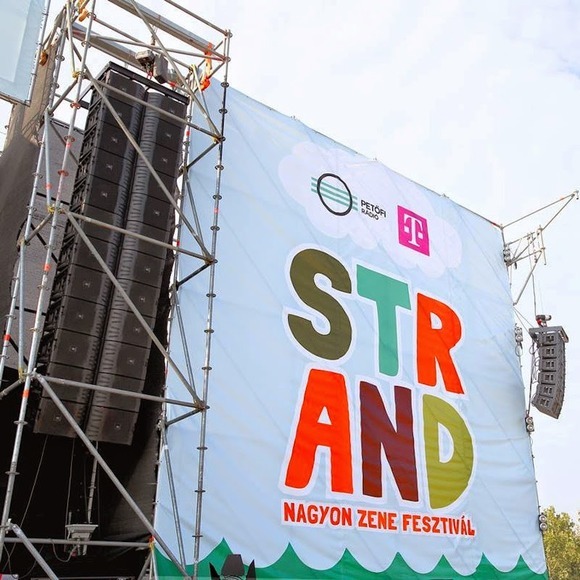 From an extravaganza held in downtown Budapest to the beach festival at Lake Balaton, JBL systems that proved popular over the summer included VTX V25 line array loudspeakers, two subwoofer models (the VTX S28 and VTX G28) and VERTEC line array loudspeakers. Crown I-Tech 4x3500HD amplifiers powered the systems. The main stage at the Belvarosi Fesztival, a free music festival held in inner-city Budapest in late May that features live jazz, rock, pop and folk concerts on three different stages. Viva Comet, an international music competition Hungary has been sending contestants to since 2004. The OTP Simple Main Stage at Fishing on OrfU, a festival combining camping and music that offered festival goers more than a thousand tents this year. The A38 Stage at the Sziget Festival, one of the largest multicultural events in Europe, that is held on an island – known as the Island of Freedom – in the heart of Budapest. Now in its 22nd year, the festival attracted nearly 400,000 fans from more than 70 countries in addition to the approximately 5 million who followed along online. The Pepsi Main Stage at the 38th annual EFOTT, the festival for university and college students, popularly known as “the country’s biggest student party.” The lineup on the Pepsi Main Stage this year included Ivan & the Parazol, Fish! and Paddy and the Rats. The Petőfi Radio - Telekom Main Stage at the Strand Festival, which took place in August as part of the musical event circle around Lake Balaton. The vast majority of the performers came directly out of the alternative/underground Hungarian music scene. The OTP Junior-Petofi Radio Main Stage at the 22nd annual Volt Festival, held for six days each summer near the city of Sopron, which sits on the Austrian border near Lake Neusiedl. The festival is known as a “family friendly” event that attracts children and the elderly in equal numbers. This year’s festival culminated with a performance by the Arctic Monkeys and drew 120,000 fans with an additional 500,000 following online. The 2014 Balaton Sound festival attracted 145,000 fans over the span of four days and five nights. The Party Arena and Jäger Stage were both equipped with HARMAN audio systems, where top performers included Muzzaik, Hot X, Statik and Ludmilla. The VTX systems were sold through Bert Audio, HARMAN Professional’s distributor in Hungary (www.bertaudio.hu).